A Dog’s Vacation Paradise. While you’re away let your Doggies play!!! 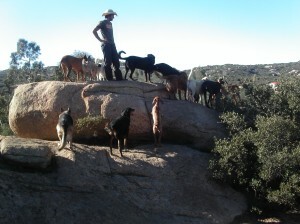 High at the top of the mountains, overlooking Cleveland National Forest, is Alpine Dog Ranch and Retreat. 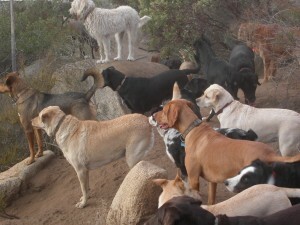 This is a haven for the beloved dogs of the people of San Diego. Sometimes travel is necessary and it can be difficult to take your dog. We have the solution. Your dog can go on vacation too. 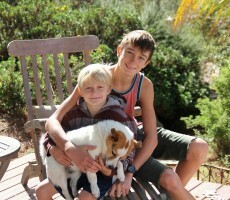 He or she will be safe, happy and cared for at Alpine Dog Ranch. While you travel, your dog can enjoy a five star getaway at our mountain retreat, a licensed and insured, fully fenced, four acre ranch, and play the days away. 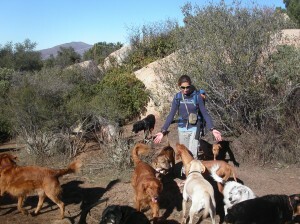 Your dog will never be left alone, as the ranch includes twenty four hour on site staffing. This is not a kennel, it is vacation ranch for dogs. Everyday your dog will run, swim in our waterfall and pond, socialize, chase balls, climb rocks, hike trails, hunt for lizards, and receive human affection and attention. Everyday your dog will breathe fresh air, instead of being stuck in a chain link dog run, missing you desperately with little or no exercise. Everyday you have peace of mind that your dog is happy, safe and cared for while you are away. All this for no extra charges!! If you have further questions, please contact us by telephone or email. And remember, we always welcome visitors to the Ranch. Bring the pups to check it out for yourselves! There is no better place to leave your pet when you travel. We are committed to taking the anxiety out of leaving your dog in a typical kennel. We look forward to meeting you and your dog!